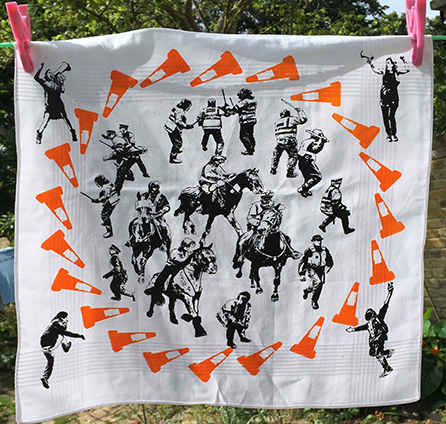 These handkerchiefs commemorate student protests during 2010 and 2011 against the UK coalition government’s education cuts. All featured figures come from photos taken during these demonstrations. Probably most famous of all such commemorative memorabilia is the silk handkerchief printed with a depiction of the Peterloo Massacre in 1819. No self-respecting radical at the time would be seen without one.